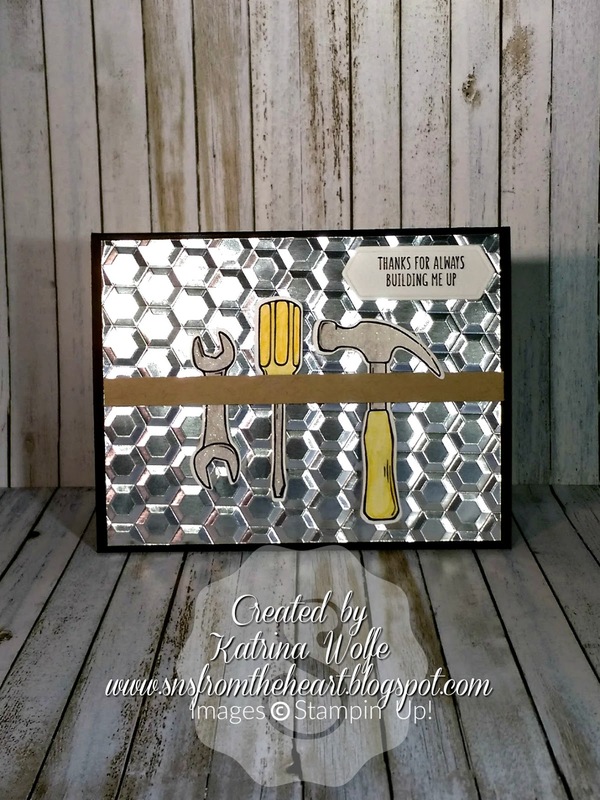 Katrina's Kreative Heart: Nailed It Chrome Style! Anyway, I have a cute card for you that is perfect for the men in your life. It uses the Nailed It bundle and I LOVE LOVE LOVE this bundle! To begin, I ran a piece of the Silver Foil paper through the Big Shot using the brand new Dynamics Embossing Folder, Hexagons. This is such an amazing effect on this card. It totally looks like chrome here. I then adhered that to my basic card front using Tombow liquid glue. I then stamped my images onto Whisper White cardstock using Black Archival ink and colored them in using my beloved Watercolor pencils and blended the color out with my blender pens. I cut each tool out with the coordinating dies from the bundle and stamped the sentiment and cut out with the die and adhered them onto the the card front using Stampin' Dimensionals. I cut a piece of Crumb Cake cardstock 1/4" x 5 1/4" and adhered to the center of the card, over the tools using a Stampin' Dimensional on each end. Fast and Simple, just the way I like it but it still packs a punch! Thanks for stopping by. I really appreciate that. Please leave a comment below and let me know your thoughts on this card.